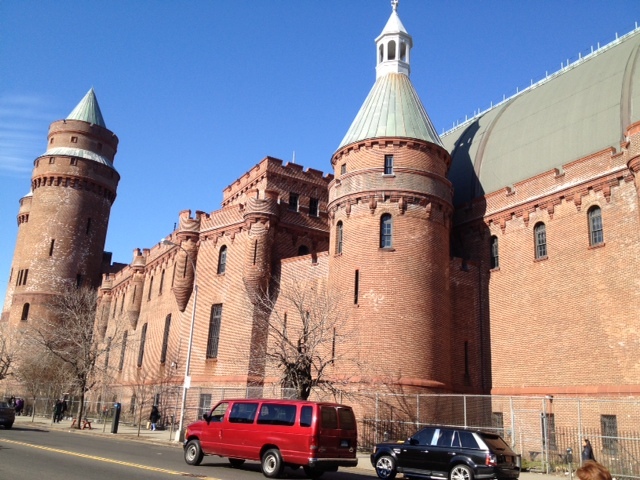 Daniel Massey of Crain’s reported today that Bronx Borough President Ruben Diaz, Jr. and other borough elected officials will announce their support for the Kingsbridge National Ice Center’s vision for the Kingsbridge Armory. The project is one of two under consideration by the city’s Economic Development Corporation, the other one being a small-business market like the DeKalb Market in Brooklyn owned by Young Woo. For more info on both prospects, click here for a link to BronxTalk which featured presentations by both potential developers. An interesting note: Almost 20 years ago, when I first began reporting on the vacated Armory, Oliver Koppell, now a Council member but then a state assemblyman, loved to talk about the possibility of the Armory being home to an ice complex. As I recall, he said his daughter had trained at such a facility in Lake Placid. No one really paid that much attention. But despite several other non-ice proposals in the mix over the two decades, Koppell never seemed to let go of the idea entirely. I remember him telling George Pataki about the ice center when the former governor came to tour the facility several years ago.